← Another kitty anchors herself in our home! We’ve encountered Matthew Phipps Shiel (1865-1947) before on this blog, when I discussed his short tales of weird fiction, most recently collected in The House of Sounds and Others. I found the quality of his writing to be a little uneven, but he does achieve moments of true horror. 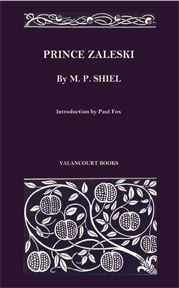 Prince Zaleski (1895) represents Shiel’s contribution to the mystery genre, and is his answer to Sherlock Holmes. The ‘compilation’ is a rather short one — only consisting of three stories — but the stories are clever and even wonderfully creepy at times. The character of Prince Zaleski is a rather eccentric one. An exiled Russian nobleman, he lives in an abandoned abbey with his gigantic African servant Ham. His regular pursuits involve reading, smoking opium and cannabis, and lounging amongst his odd collection of antiquities, which includes an Egyptian sarcophagus complete with original mummified occupant. Zaleski’s musings are only interrupted by M.P. Shiel himself, who comes to Zaleski for help with the most baffling criminal mysteries of the day. Zaleski solves the case by Holmes-style deductive reasoning, usually without even leaving the confines of his lonely home. The similarity between Holmes and Zaleski is no coincidence. In 1893, Arthur Conan Doyle had killed off his most famous character to free himself up for other works. The public was horrified; in the absence of Holmes, it was probably clear that people would be eager for other stories about enterprising investigators solving mysterious crimes. The stories themselves are quite charming. Though they are not as clever and iconic as the tales of Doyle, they possess a certain darkness about them that I enjoyed. The Race of Orven. Zaleski is asked to help with a truly baffling murder. The wealthy Lord Pharynx has been found shot and stabbed. A woman has been caught literally red-handed, in more ways than one, but is she really guilty? And how can one explain the mysterious apparition that was seen by one of the servants elsewhere in the house right after the shooting? The Stone of the Edmundsbury Monks. A precious stone that dates back to the Crusades has been stolen, and its owner driven nearly mad by the theft. The likely thief lives with the owner, however, and has been behaving in a bizarre and brazen manner. Zaleski seeks to solve a puzzle that dates back centuries and is connected to a secret society. The S.S. All of England is in a panic as a plague of suicides has washed over the country; thousands are dead. Zaleski leaves the comfort of his home and risks his own life to find an explanation. The answer leads Zaleski to ominous conclusions about the fate of society itself. This is the strongest of the tales, and has a wonderfully creepy atmosphere. One of the fascinating things about these stories is that each puzzle is strongly connected to a scientific concept! Chemistry, biology and physics each make an appearance in the collection; one story even makes detailed use of an Atwood machine, one of the fundamental classroom demonstrations of mechanics! The mysteries are not as clever as those of the Sherlock Holmes tales, but have their own unique charm to them. Those who like mystery fiction and weird fiction will enjoy this blend of the genres.